Pet-friendly homes are starting to catch on in Japan. Does it make sense to design homes to cater to the enjoyment of cat and dog pet owners? Several design firms are grabbing the pet-friendly home idea by the tail and running with it. The demand is there, at least in Japan, claims Fauna Plus DeSIGN and its director, Keiji Hirose, a firm known for designing a custom home for 16 cats. The heart of the home features a cat-climbing tree that serves as a spiral staircase leading up to a catwalk on the second floor of the unit. The catwalk forms a zigzag design and can also be accessed via steps that protrude from the wall, similar to House Taishido’s shelves. Several of the steps are next to small holes in the walls that lead to other rooms. a floor-to-ceiling scratching post column, wrapped in hemp rope. 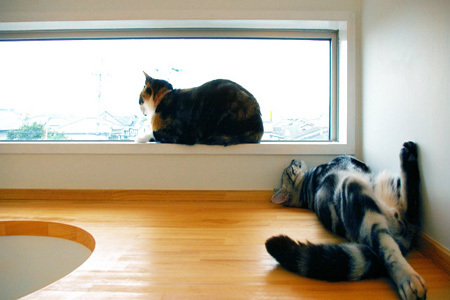 According to Fauna Plus DeSIGN estimates, the cost to design a two-story, detached wooden home built to cat specifications ranges from 3.2 million yen (about $42,000 in U.S. dollars) for a 20-square-meter space (about 215 square feet) — on up to 13 percent of the total construction costs for a space measuring more than 50 square meters (about 538 square feet), the company reports. Never a dull moment for cat lovers in this house. If 16 cats weren’t enough, the residence also houses five dogs, which are separated from the cats via a glass door. To house the dogs and allow them outside access, Fauna designed a rooftop garden. The firm is experienced with dog-focused projects, too, as its two most recent projects involved the design of an indoor waterproof kennel for the home of two dachshunds and the remodel of an apartment that houses a basset hound. Exterior photo of “House Taishido” in Tokyo. Features of a dog-friendly home typically include proper ventilation to eliminate hair shed; odor absorbent materials; and a dog shower or toilet. Other dog-friendly home features include: dog-level peepholes in garden walls, pet-door installations in each room, outdoor courtyards in dense urban housing areas, and scratch-resistant flooring. “For dogs it’s … more difficult (than designing a home for cats),” Koyama said, adding that special attention must be given to materials used for the floors and stairs. The cost to design a two-story wooden home to dog specifications can range from 3 million yen (about $39,000 in U.S. dollars) for a 20-square-meter space (about 215 square feet) up to 12 percent of total construction costs for a space exceeding 50 square meters (about 538 square feet). 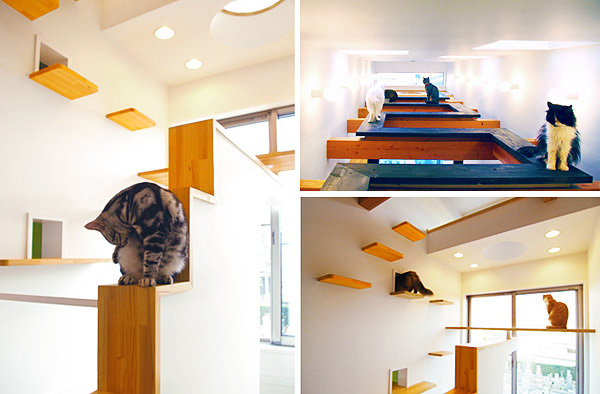 Located in a densely populated urban district west of Tokyo, the three-story, 30-square-meter home features stepping-stone-like shelves that allow the home’s feline resident to navigate vertically into and out of the main living room via small openings. The small openings in the wall lead to other rooms on the first floor. The cat can also access the second floor of the unit by walking up the shelves and slipping through a slot that functions as a cat-only portal. Freeing up the unit’s staircase from cat traffic allows the space to double as a home library, with bookcases and space for reading. These cats appear to be lying down on the job. 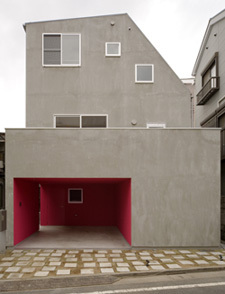 According to Koyama, the house was not initially designed to be a “cat house,” and those features took shape later in the design stages. “It wasn’t too expensive (to add the cat features), and was quite fun,” he said, adding that the home’s design focused on creating a space with rooms of different heights and sizes connected by doorless transitions and windows. This initial design concept inadvertently made for excellent cat mobility. Posted on December 30, 2011, in Uncategorized and tagged animals, cats, construction, decorating, homes, japan, pampered pets, pets. Bookmark the permalink. 1 Comment.